The Catholic News Services reported on November 26, 2012, on “50 Years of Ecumenical Progress” with a video report. The World Orthodox and Roman Catholic participants in the North American Orthodox-Catholic Theological Consultation, especially the two co-secretaries, laud the coming reconciliation between the Patriarchates and the Vatican. In the interview Jesuit Father Brian Daley and World Orthodox Father Thomas FitzGerald praised the ecumenical endeavours. 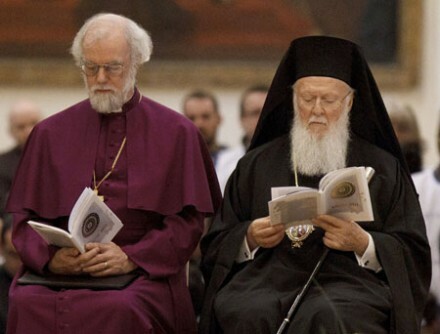 From a traditional Orthodox perspective, however, both men are heretical in their theology and teachings, and the coming planned official union between the Vatican and the Patriarchates (something that has been planned by the Jesuits since the 60s, at the very least, in terms of modern planning), will be the culmination of the heresy of Ecumenism (which teaches that the Church is divided into bodies that hold mutually contradictory formulations of dogmas). The video montage contains images of Roman Popes Paul VI, John Paul II, and Benedict XVI along with an assortment of World Patriarchate and Monophysite leaders.